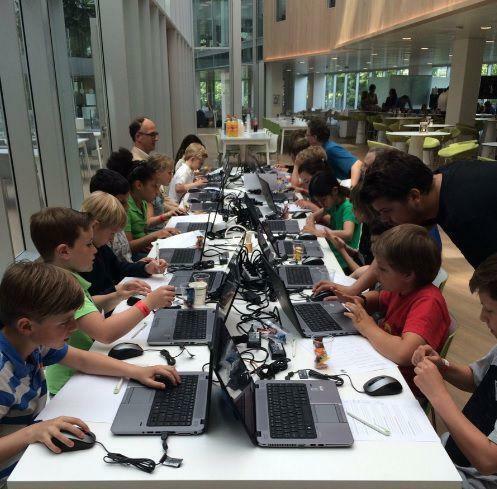 On Wednesday 8 June HSD partner Deloitte welcomed 160 talented primary school students (8-12 years) on the Day a Week School which was held in The Edge (Amsterdam). This Day a Week School offers education to talented students with outstanding school performance and advanced learning capacities which will challenge and stimulate them. A great example of the HSD's goal to stimulate access to talent with a focus on IT and cyber security. Deloitte introduced the students to the world of Innovation and Technology by offering the students workshops related to IT and cyber security. The programme, which included the workshops: Internet of Things, Robotica, Augmented Reality, Virtual Reality and Hacking, was organised by the Deloitte Impact Foundation. 37 collegeaus of Risk Services, Deloitte Digital and other departments helped co-creating the event. Wassili Bertoen (partner Deloitte and director Center for the Edge) gave a presentation on technological developments and the future together with his 10-year old son Ties. The programme proofed to be a huge success and great feedback was received by the children and their partents. Deloitte actively pursues to actively contribute to our society through the Deloitte Impact Foundation. This is an important worldwide goal: to create an impact that matters.